My mother and I planned a trip together which happened to coincide with her birthday. I wanted to turn the trip into a birthday vacation, so I came up with lots of ideas to celebrate it (see the Celebrating Birthdays at Disney article). For the piece de resistance, I contacted Gifts of a Lifetime to see if they could plan a birthday celebration for my mother. You can fill out a Pre-Event Questionnaire form at their Web site (http://www.giftsofalifetime.com) to get things rolling. I received a response back from Jane (the president of Gifts of a Lifetime) suggesting an event that would fit my budget. Tinker Bell's Birthday Event--In the Magic Kingdom you go with your mom to the Snow White Wishing Well under the pretext of having her throw in a coin and make a wish for her birthday. Waiting there at the wishing well will be a letter for mom. The letter will explain that Tink was very annoyed that you did not invite her on your mom's birthday trip and now Tinker Bell has hidden mom's birthday card. Now you and mom must follow the clues to find it or it will be hidden in Neverland forever. The first clue will lead her to the second and so on. After 4 clues she will finally find her card and an apology from Tinker Bell. This sounded like the perfect event for my mother! She loves Tinker Bell and has a bond with the Magic Kingdom from her time spent working there on the College Program. So I sent back a confirmation to Jane, along with photos of my mother and me. Surreptitiously glancing at my watch every few minutes, I gently guided my mother over to Cinderella Castle for our 1:00 pm rendezvous. This was a little tricky at times, as my mom wanted to ride the Liberty Belle Riverboat -- I knew we didn't have time for this, and I had to fib a bit and tell her we'd do it later if we had time. Using her casual remark about wanting to photograph the carousel horses at Cinderella's Carrousel, I maneuvered here over the Castle by a quarter to 1:00. Knowing she'd be a little suspicious of my suggestion to throw a coin into the well, I instead mentioned that I wanted to take some research photos of a new "well" that had been built near the castle (it wasn't really new anymore, but it was new to her). At a few minutes to 1:00, we approached the wishing well -- right on time! Once at the wishing well, I noticed a few other guests sitting on nearby benches. I'd wondered if Jane would be there, but I didn't see her. What I didn't realize was that a man dressed like a typical Disney guest and carrying a large Disney shopping bag was in fact one of Jane's pixies! I could see a large, laminated card propped on a bench, however. Hoping to get my mother to notice it, I asked her to pose for a couple of pictures, but she was oblivious to it. So I asked her to stand by the bench for a photo. She turned around and headed for the bench, then paused in mid-step. I heard a shriek of surprise as she read her name, printed in big letters, on the front of the card. She turned around with a look of pure delight (see photo). My mother posing by the wishing well before noticing the card (circled in yellow). The feet on the right (circled in red) belong to the pixie! The card was nicely designed and laminated -- very classy. The front of the card read, "Pixie Dust Express Special Delivery for Carolyn Tody, Wishing Well, Magic Kingdom, March 10, 2003"
The inside of the card revealed that her birthday card had been hidden by Tinker Bell, and that "the first place you need to look is in the bushes outside of Tinker Bells Toy Shop." Aha! A scavenger hunt! My mom was beside herself with glee -- this was going to be fun! My Mom knew exactly where Tinker Bell's Toy Shop is (right behind the castle) and she made a beeline for it. Alas, the first couple of bushes she looked in turned up nothing. Jane, who was hovering on the sidelines, waved in my direction while my mother had her head in a bush. 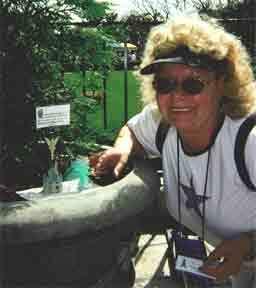 Jane indicated the general location of the next clue. My mom hadn't yet found it, so I casually suggested there may be more bushes to look in. "Oh, that's a good idea!" she admitted. And off she went to investigate more bushes. The first clue, nestled in the greenery. Within a few minutes she'd found the next clue -- it was printed on a business-size card and also laminated like the larger card. A guest sitting on a bench nearby remarked that someone had been ferociously guarding that card! Gee... must have been a pixie! 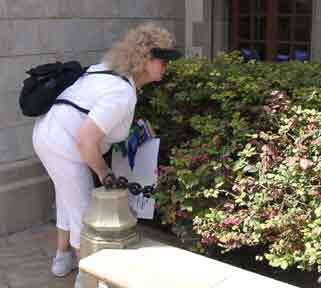 Mom searches the bushes for her card. The card read, "Tink stopped here just long enough to take a bath in the dew then she was off to Ye Olde Christmas to add some sparkle to the Christmas Trees. You should look for a clue there." Well, that was easy! My mother knew exactly where to look -- Ye Olde Christmas Shoppe in Liberty Square was where she used to work (though it was an antiques shop back then). So over we marched to Liberty Square! 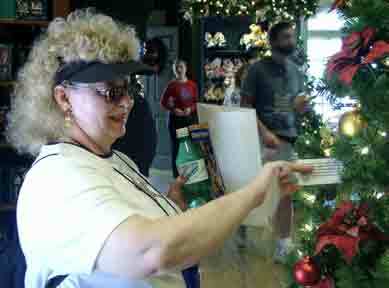 Once at Ye Old Christmas Shoppe, my mom looked for Christmas trees outside the building. Finding none, she headed in and began browsing one of many decorated trees in the shop. When Mom was on the third tree, I spotted Jane through an open door -- she was waving wildly and indicating the correct tree! As it turned out, it was one my mom had already looked over. Not sure whether I should say something, I simply asked my mom how she was doing. "Oh, are you trying to tell me something?" she queried. "No," I lied with a smile. "Your body language speaks for itself!" she exclaimed. Mom finds a clue in the branches of this Christmas tree. She headed back to the last tree. A few minutes later she found the clue, nestled in the branches of the lighted tree. The next clue card read, "Of course she couldn't stay here long. She knew that Captain Hook would be visiting his cousins at Pirates of the Caribbean and she wanted to listen in on their meeting. Enjoy the ride and THEN look for an empty fountain near the entrance." My mom knew that Pirates of the Caribbean was in Adventureland, but not exactly where. She hinted that she wanted me to lead her there, but I decided that was too easy. So I suggested she get out her guidemap and look it up. She did, and off we went to Pirates! The wait for Pirates wasn't too bad and we got in line, sighing in relief as we hit the cool cellar through which the line weaves. After a 20 minute wait, during which we wondered more than once if we were really supposed to do the ride first, we boarded our boats and enjoyed the attraction. 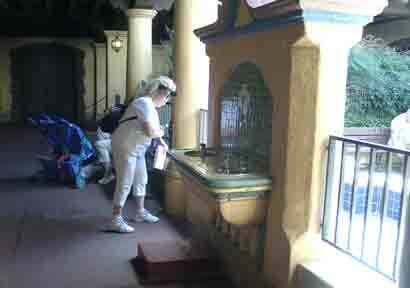 After Pirates, my mother began looking for empty fountains in the shop at the ride exit. After a few minutes, I quietly reminded her that the clue said to look for near the entrance to the ride, not the exit. Once there, she spotted several drinking fountains and investigated each thoroughly. I was pretty confident that the next clue wouldn't be at a drinking fountain, but I let her look. Eventually she wound up at a drinking fountain that happened to be right behind a huge empty fountain. Yet she still hadn't noticed the empty fountain! I kept quiet just a few minutes longer; she found the fountain herself and whipped around the corner to check it out. Sure enough, a gleaming white clue card rested on the edge of the fountain. Mom searches the DRINKING fountain without seeing the EMPTY fountain behind it. This time, I noticed that a man was sitting near the fountain, alone, just like at the wishing well. It occurred to me briefly that he could be a pixie, but I was too distracted to give it much thought. The important thing is that my mom didn't notice him! The next clue card read, "Tink was happy to learn that Captain Hook was not up to any new tricks. As they say in Neverland: all's well that ends... er... well." The last clue was the hardest. The previous three had told her directly where to go, but this one was more cryptic. My mom's first response to the clue was, "So this is the end?" I just smiled at her. She figured out for herself that this carefully worded card was another clue. She immediately latched on to the word "well" but wasn't immediately sure where to go. I asked her if we hadn't visited some wells that day, and the light bulb went on over her head. The wishing well! And off we went back to the castle. On the way back, I discovered the memory card in my camera was malfunctioning. So I rushed into a shop to buy a disposable camera. I didn't want to miss any shots. This caused a pixie to come up and ask me if everything was ok -- they really kept on top of things! My mom quickly spotted the treasure near the wishing well. A shrub planter in the corner was harboring a birthday card, a Tinker Bell-and-castle card holder, and a bag of pixie dust. A final card left at the scene read, "Once Tink realized it was wrong to steal your card she raced to fly it back here. She is so sorry; she even left you some Pixie Dust! Happy Birthday, Carolyn!" While we were admiring the goodies, Jane and her pixie stepped over to say hello! (Sorry, no photos of Jane or her pixie -- we wouldn't want to ruin the surprise for anyone!) We chatted about the event and thanked her profusely for making it happen. My mom was all smiles. 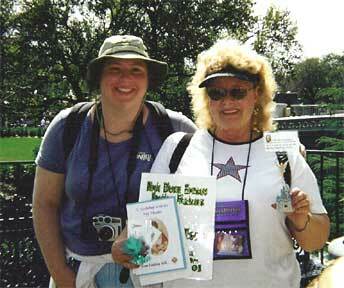 She said, "I knew there was no way Jenny could have hid all these clues -- you did such a great job! This really makes me feel special." (Ok, I'm paraphrasing a bit, but hey, we were all excited!) Jane told us about several upcoming events, which sounded even more exciting. It makes me wish someone would plan an event for me one day. (Are you reading this, Dave? Ha ha!) Jane did mention she might be creating an event that uses a PassPorter in it, too! Jennifer and her Mom pose with the goodies. Jane and her pixie pulled off the event without a hitch and far exceeded my expectations. My mom was ecstatic and I had a great time. I couldn't have asked for more. Thank you, Jane and Gifts of a Lifetime! You provided the perfect grand finale to my mom's birthday vacation! If you'd like to learn more about a Gifts of a Lifetime event, visit GiftsOfALifetime.com. You're also welcome to e-mail me at jennifer (at) passporter.com if you'd like more details about this particular event.